In a previous blog post, we have described the different options you have when creating a new web application with Visual Studio 2013 (VS 2013) and provided an overview of the various ASP.NET features and NuGet packages present in the templates. 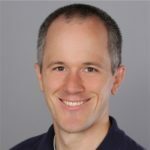 In this post, I am going to take a specific template in VS 2013, namely the Web Forms template with no authentication, and describe how to build this project from scratch. At the end of the tutorial, you will end up with a template with content that is pretty much the same as creating a new VS 2013 project using Web Forms template with no authentication (File > New Project > ASP.NET Web Application (Visual C#) > Web Forms > No Authentication). As we go through this post, you can see where and how different web technologies are leveraged by the template, which you can take and similarly apply in your existing web projects as you need. We start with the simplest web template: Open Visual Studio, File > New Project > ASP.NET Web Application (Visual C#) and provide a name for your project (eg: WebFormsNoAuth). In the ASP.NET project creation dialog, select “Empty” template without any additional options and hit OK.
Open the NuGet package manager UI or console window and install the package “bootstrap”. You can read more here about the advantages of styling and theming your website using Bootstrap. Notice that it is really easy to do styling with Bootstrap – you just needed the bootstrap files in your project (installed by the bootstrap NuGet package), and then reference the bootstrap.css and jQuery / bootstrap.js in Site.Master. We then use many Bootstrap css classes to do the styling in pages like Site.Master (eg: navbar, navbar-collapse) and Default.aspx (eg: col-md-4, btn). We also added a Site.css to add some custom styles. You can also add styles in Site.css to override styles already defined in Bootstrap. That way, if you update your Bootstrap version in the future, your overrides in Site.css remain. We added a favicon.ico file that many browsers will use to show in the address bar or browser tab next to your site’s URL. At the end of this stage, you can try to F5 your project and see that you have a fully functional web application with basic pages. The pages are styled with Bootstrap and are responsive to different browser sizes. The project is fairly simple with a clean Web.config, and just 2 NuGet packages in packages.config : bootstrap and jQuery. You can view the full code at this stage in the Git repo here. When you view a page like Contact.aspx in the browser, you can see that the extension “.aspx” still shows up at the end of the URL (eg: http://localhost:14480/Contact.aspx). We can change this to generate a friendly URL without extensions, and add routing to your web application (similar to MVC projects) by using ASP.NET Friendly Urls. ASP.NET Friendly Urls also add View switching functionality so you can easily between a mobile view and desktop view. If you do not have an existing RouteConfig class (like in our project), a new RouteConfig.csfile will get added for you. If you already have an existing RouteConfig class in your project, you should call EnableFriendlyUrls() in your RegisterRoutes method *before* any existing route registrations. It automatically adds a Site.Mobile.Master and ViewSwitcher.ascx user control to help you easily add mobile views for your Web Forms project. Now you can F5 your project again and see that the website uses ASP.NET routing and the URLs show up without the .aspx extension (eg: http://localhost:14480/Contact). You can also fixup the links in Site.Master to reference the friendly URL instead. At this stage, if you F5 and view the page in your browser, and use the F12 tools to inspect the HTTP requests, you will see that the CSS files are not bundled yet. Alternatively, you can override the Web.config by setting with the EnableOptimizations property on the BundleTable class. So, if you want to turn on bundling and minification with debug=true, then add a BundleConfig.cs file to your App_Start folder with the following code. At this stage, if you F5 and view the page in your browser, and use the F12 tools to inspect the HTTP requests, you will see that the CSS files are now bundled and minified. The ScriptManger control in ASP.NET 4.5 makes it easier to register, manage and combine scripts using the ASP.NET WebOptimization feature. One feature in ASP.NET 4.5 is the decoupling of the “Microsoft Ajax script files(MicrosoftAjaxCore etc)” and the WebForms scripts(GridView.js etc). You can serve these scripts from your application Scripts folder rather than load then up from System.Web. This makes the scripts easily redistributable and updateable. Following are the steps to remap framework scripts. See ‘Remapping Framework scripts’ section here for more details on this feature. c. Add the installed js files to a bundle in BundleConfig.cs and then reference the bundle from Site.Master. b. Add the installed js files to a bundle in BundleConfig.cs and then reference the bundle from Site.Master. You can use Respond.js to provide better support for HTML5 elements and CSS 3 media queries in older browsers like IE 8 and below. Finally, you can add a _references.js in your Scripts folder. This allows VS to provide JS intellisense when you are editing these files. 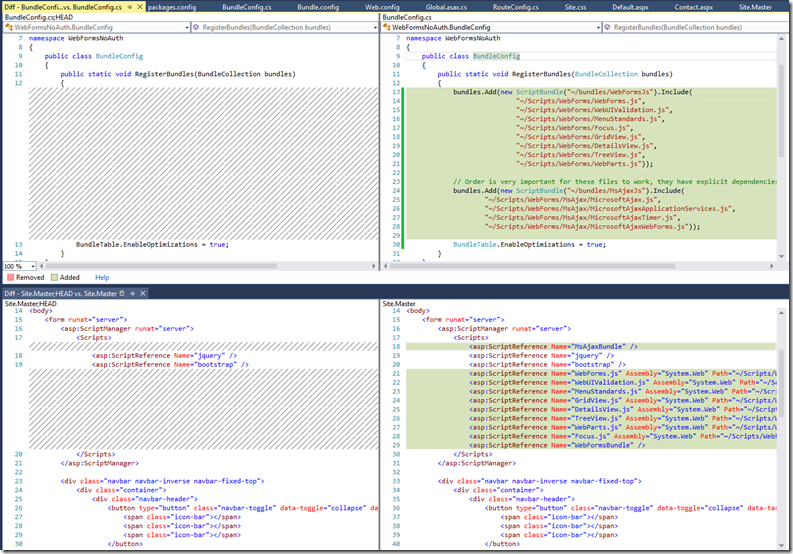 With VS 2013, we added a new feature called autosync. With this enabled (as shown below), when you add a new JS file to your project, it will automatically add an entry in the _references.js file for you. Ok, the post was a little long, but I hope this post was useful for you to learn about some of the different technologies that you can leverage using ASP.NET. You can view a list of all the commits for this project here.